NASA EDGE is an unscripted, non-traditional video podcast (vodcast) designed to highlight all things NASA in a unique and fun way. 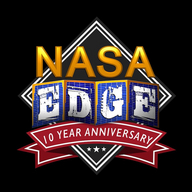 By using a combination of funny, offbeat and informative sketches, features and interviews, the NASA EDGE team creates a vodcast that reaches a much broader online audience. Built in the framework of sports talk radio (i.e. Mike and Mike in the Morning - ESPN Radio), NASA EDGE has generated a positive buzz for Space Exploration and NASA in a way in which young teens and adults can relate.